Sunday Reader Question: How to Get to the Maldives Using Miles? 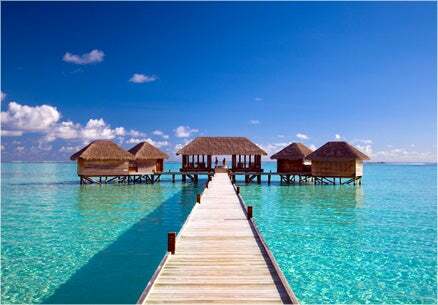 Use miles to get to the Maldives so you can stay at hotels like the Conrad Maldives. No American carrier flies into the Maldives (MLE is the airport code), so you will need to leverage both alliance and other airline partners. Finding two seats will likely be a challenge, but with enough flexibility you should be able to make it work. Note: Once you get to the Maldives, the flying may not stop there- to get to the Hilton you’ll need to take a ~$500 seaplane flight to their atoll, so even if you use miles and points for air and hotel, it’s still going to be a pricey trip (though most likely an amazing one at that!). American Airlines classifies Maldives in the Indian/Subcontinent zone, so one-way coach would be 45,000 miles and 67,500 for business. British Airways flies from London Gatwick to the Maldives several times per week and they still fly Tampa and Orlando to Gatwick (though you’d have a long 10 hour layover), essentially taking two days to get there, plus you’ll be stuck paying hefty taxes and fees on the tickets (think $1,000+). Award space searchable on aa.com. Cathay Pacific flies to Colombo, Sri Lanka, which is only 483 miles from Male and the flights to/from Male are generally inexpensive- even in business class. Award space searchable on britishairways.com or Qantas.com. Using British Airways Avios: Expect to spend 180,000 Avios and $1,400+ in fees for roundtrip awards in business class (See picture above for one-way pricing). BA Visa Travel Together ticket. The same award booked using AA miles will only cost 135,000 miles and $1,300 roundtrip. Delta charges 60,000 miles for economy and 120,000 for business to Maldives since it’s classified as South Asian Subcontinent. Delta allows a stopover and open jaw, so you can also include a stop in India. Delta also partners with Jet and Kingfisher, which opens up a lot of access to India. United and US Airways both charge 80,000/120,000/ 160,000 for coach/business/first class partner awards. Singapore Airlines flies between Singapore and Male, but availability is limited and is best checked using the ANA Tool. Etihad flies via Abu Dhabi and you can use American Airlines miles to book those awards, but you have to call American for availability and there needs to be a published fare for your route, or else you may be charged two separate awards- US to Abu Dhabi and Abu Dhabi to Male. 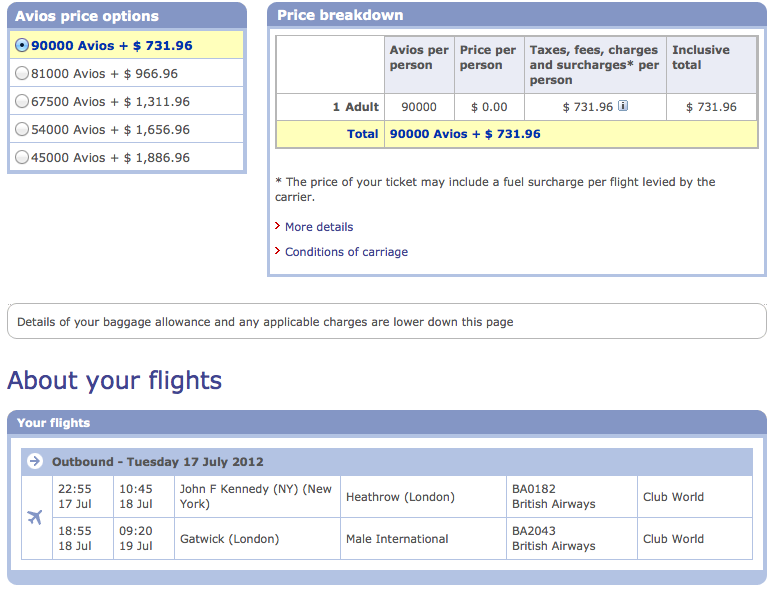 Qatar flies via Doha and is bookable using United miles until that partnership ends September 15, 2012. I priced out a sample award on united.com and it was 120,000 miles and $72 for business class roundtrip. Award space searchable on United.com.